LoanPig specialise in finding the best short term loan solutions to suit the needs of any kind of consumer in the UK. Our huge panel of lenders makes it an easy matter to compare loans and repayment options and select the best payday loan or short term loan to match your personal circumstances. Many of our customers are confused about what the term APR (Annual Percentage Rate) actually means and how it affects the loans they receive. We’ve compiled this short guide to APR to provide all the answers needed and offer a useful starting point for all our customers looking at different loans from a variety of providers. As already discussed, APR is the abbreviation for Annual Percentage Rate and all lenders have to display the APR for loans they offer. This is a legal requirement and you can find out more on the website for the Financial Conduct Authority (FCA). The way APR is calculated is to ensure all costs of borrowing are included. Therefore, loan company APR rates will include the interest costs and all associated fees over a 12 month period. This makes it much easier to compare different lenders, as you’ll see APR rates do vary considerably. 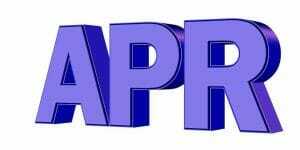 What Is The Official Reason For APR? Different APR rates may seem a little confusing due to the fact that charges are included in all quotes. For example, your lender may quote an interest rate of 14% over the year, but highlight the official APR as 17%, and this increase is due to all the charges included within the rate. Although it may seem a little complex, it actually makes very good sense. Displaying total APR in this way makes it much easier for you to compare loan costs and choose the lender that is best suited to your budget. How Is Interest Worked Out On My Loan? Most lenders use their quoted interest rates to calculate the interest due on loans. So, if your lender applies an interest rate of 20% and you borrow £100 for 12 months, the total amount you would pay back over the year would be £120. The APR rate quoted by your lender is the total amount you will pay for the cash you borrow calculated over the entire year. In the simplest terms, if your lender quotes an APR of 30% and you borrow £100 for six months, the total you will repay is £115. This total cash pay back relates to the repayment of the £100 borrowed plus six months’ interest at the quoted rate of 30%. If you had borrowed the £100 for 12 months, you would repay a total of £130 to your lender. How Can I Save Money On Loans? Checking different lenders to find out what APR rates they apply to payday loans, short term loans, and credit cards means you can source the cheapest loans and save money on the charges you have to pay back. It is important to check that all providers are displaying APR rates, though. Some credit card companies state they offer credit at interest rates of just 2%, but when you look into the facts you will probably discover the interest rate charged is the monthly rate and not the APR rate. Once you understand just how APR works and the ways it impacts on cash lent then you will be in the best position to shop around and save money on the cash you borrow. Short term loans are often emergency payday loans used to top up cashflow when funds are tight, or when last-minute payments need to be made to get you out of a fix. This can make them a riskier loan option for lenders, as they also tend to be unsecured, meaning the lender cannot use your car or home as a security against defaults. For these reasons, it’s often the case that short term loans are quoted at a higher APR than loans provided by traditional financial institutions, like banks. When you need emergency cash in a hurry, it’s a speedy matter to access short term loan providers online. And, now you understand the importance of APR, you can compare lenders to source the cheapest loans to suit your needs. Shopping around for the best and most affordable loans is really easy with LoanPig. You just need to type the amount you want to borrow and the amount of time you need for repayment into our quick calculator. We search around all our lenders and get back to you with a selection of lenders most suited to your needs. You can check out the APR rates of all these selected loans on the lender’s website and make your borrowing decision accordingly. As a quick summary, see our infographic.